Yesterday I told you how Rona Ambrose, her shellshocked Harper party, and their friends in the Con media, were in a disturbing state of zombie agitation. After it finally dawned on them that electoral reform will either change their brutish party beyond recognition. Or destroy it. And how they are all calling it an assault on democracy, and screaming for a referendum, or a popular uprising. Well now they've gone full turkey. Uh oh. 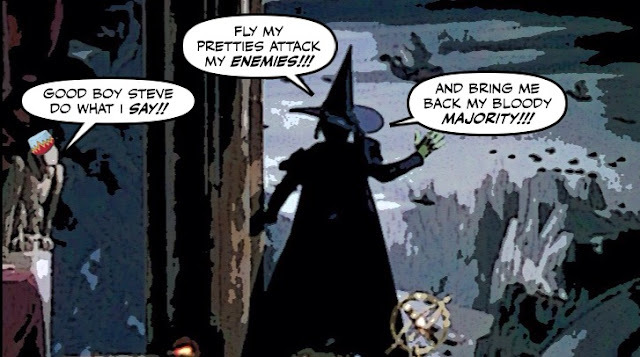 Yesterday I told you how Rona Ambrose, in the shadowy and shrunken Con War Room now known as The Crypt, had sent out a desperate message to her equally desperate followers. 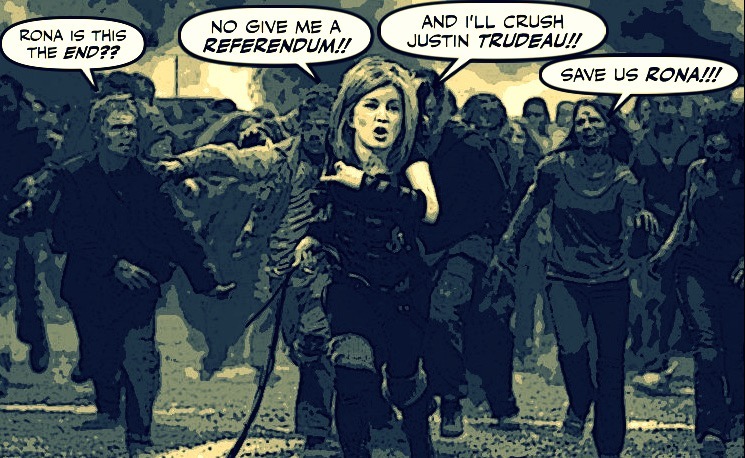 After she finally realized what electoral reform is going to do to the surviving zombies in the Harper Party. Bury them, again. And this time forever. And did hysterically demand a referendum, or some sort of uprising, to try to head off the Conapocalypse. 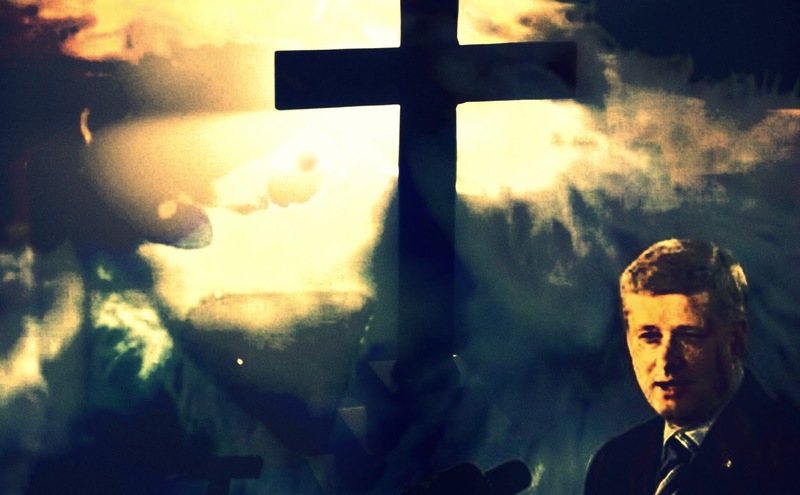 As I try to remember all the things that happened in this wild and crazy year that was both our nightmare and our salvation, two things keep jumping out at me. 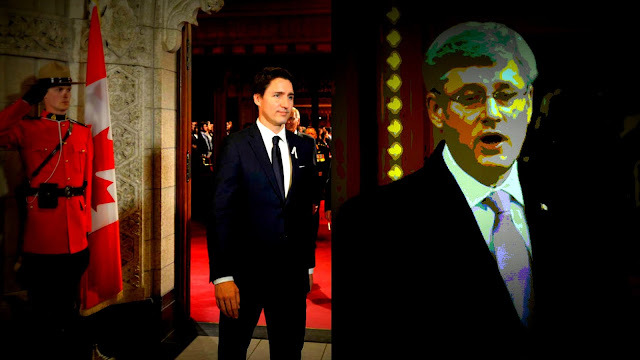 One, how low Stephen Harper and his ghastly Cons did drag us and our democracy, and shame us in the eyes of the world. And two, how quickly Justin Trudeau has been able to improve our image abroad. There's nothing that scares the Cons as much as electoral reform, and Justin Trudeau's plan to scrap the so called first past the post system. They know that it would cripple their chances of ever ruling Canada again, and that the only thing that might stop that from happening is a referendum. So I'm not surprised by this desperate tweet from Rona Ambrose. After Trudeau gave the referendum idea a big thumbs down. 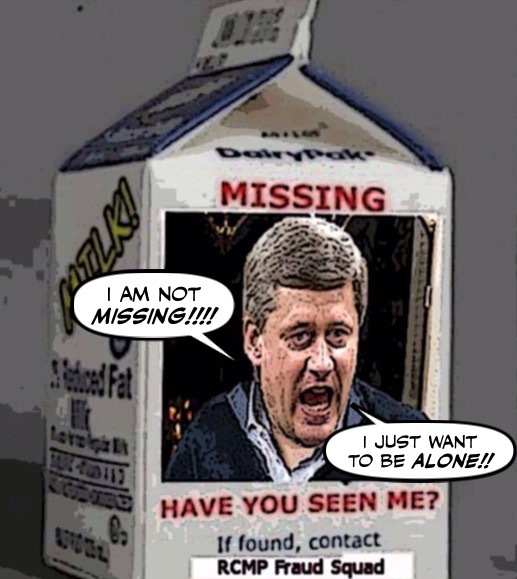 I'm sure it was the last thing Stephen Harper needed to know, in his present mental condition. Only to fail him so miserably, when Canadians blew his flying monkeys out of the sky. Isn't lying there like Harper, licking his wounds like a loser. He's getting knighted for his faithful service to David Cameron. "You see, I told you, I told you. They love me, they really LOVE me !!!!! Even if it such a small and pathetic token of appreciation. And anyone who calls the Harper years "a decade of excellence" must either be out of their minds, or in Alberta, working for a repo company. How Low Will the Cons Go to Smear Justin Trudeau? Let it not be said that the Cons will stop at anything to try to bring down Justin Trudeau. 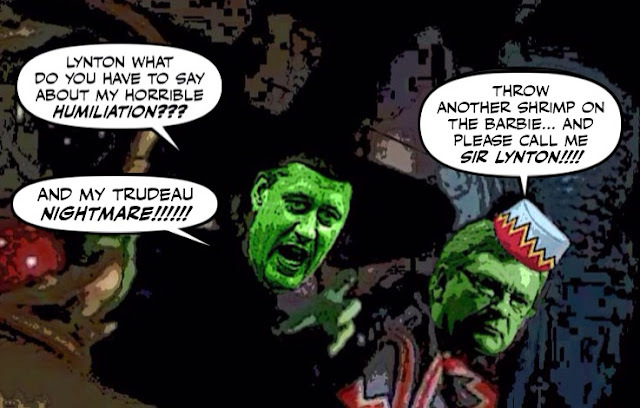 Or that Trudeau isn't driving the Cons CRAAAAZY. For there was Stephen Harper's former flak Andrew MacDougall yesterday, trying to ruin Justin's Christmas AND his birthday. By comparing him to the sleazy American rapper Flavour Flav. It's Christmas Day, and although it's a bit gloomy out there because it won't be a white Christmas in the place where I live. 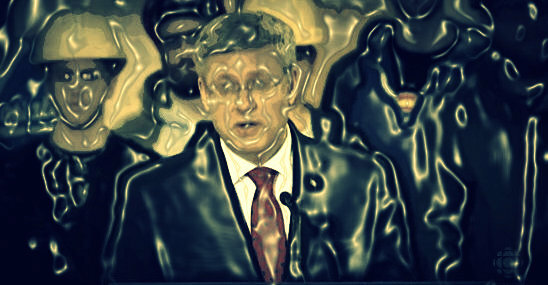 It seems to me that the lights have never shone brighter, after Harperland's long night. And never has there been so much hope in the air than there is now in our new Canada. It couldn't have been a more revealing sight. Or a more absurd one. Or one more revolting. 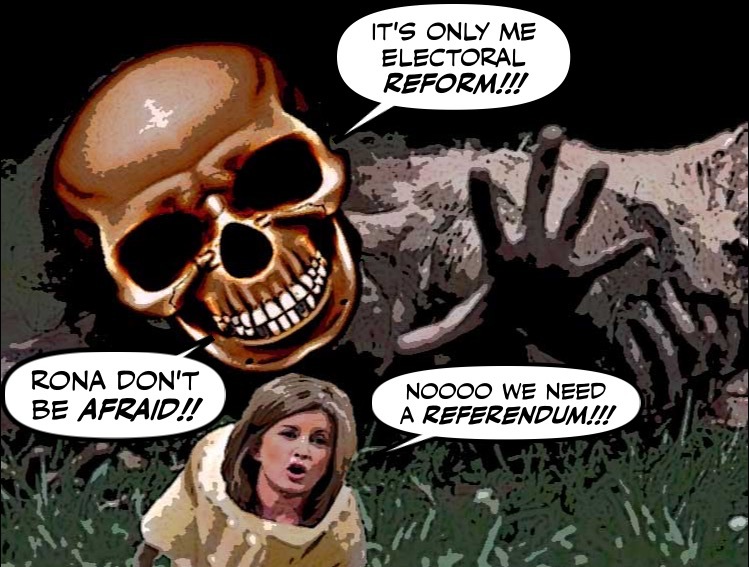 Rona Ambrose granting an interview to Ezra Levant's filthy hate mongering site The Rebel. Hammering home her Christmas message to bomb Iraq, bomb Syria, and bomb Justin Trudeau. Not necessarily in that order. While claiming her Cons are a kinder, gentler version of the Harper Party. 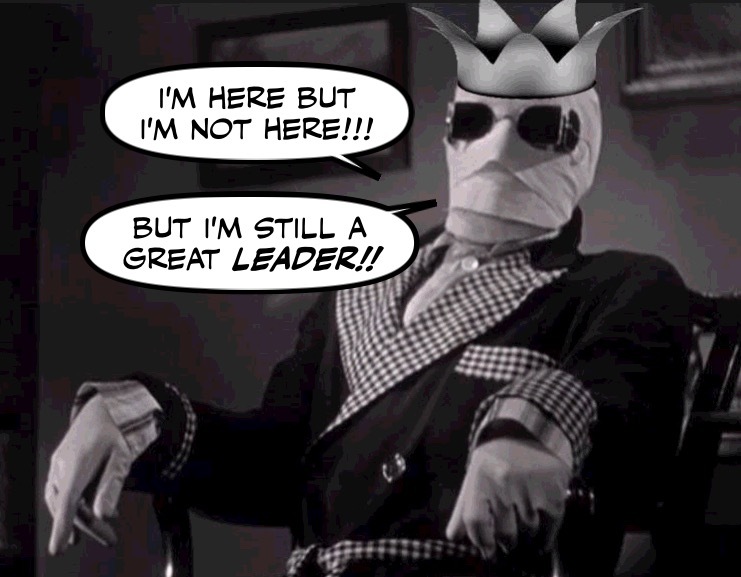 As we all know, Stephen Harper has been behaving in a very strange manner since his crushing and humiliating defeat. He has practically disappeared off the face of the earth. And hasn't been seen in public, apart from one brief sighting in a Calgary book shop where he bought a book on economics. No doubt so he could finally learn something about the subject, and not be charged with fraud if he keeps calling himself a Great Economist Leader. 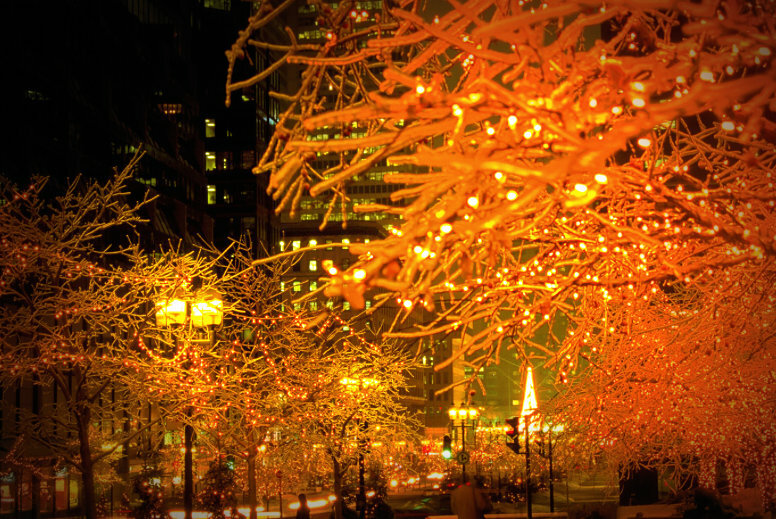 As you know I have been having a bit of trouble getting into the spirit of the season. 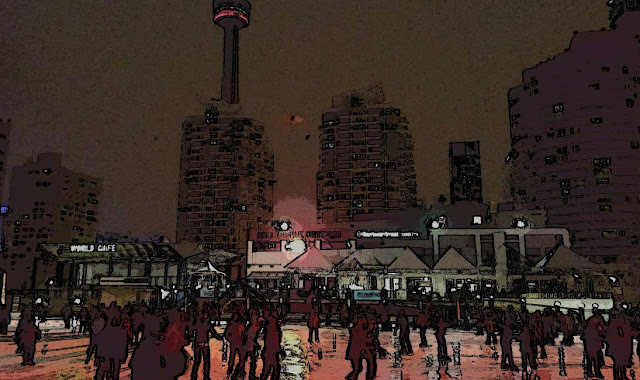 It has been dark and gloomy and foggy where I live, and so warm the skates stick to the ice, and it's hard to believe it's winter in Canada. And what with being forced to go shopping, which I hate. And what with the crazed Cons spewing bile and death threats all over the internet, it was threatening to turn into a bit of a nightmare. 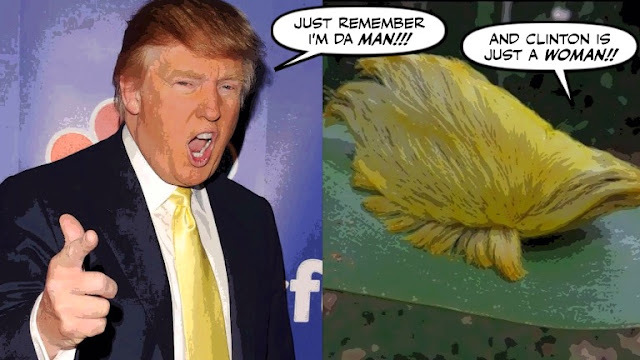 I already knew Donald Trump was a RepubliCon clown, and that every inch of him was poisonous. 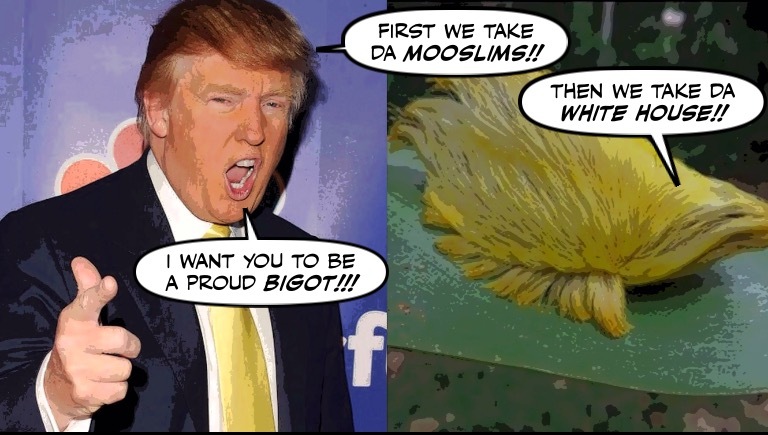 I knew he hated Muslims and Mexicans, and anyone who dares stand up to that bully bigot. But it still stuns me to see how much he hates women. 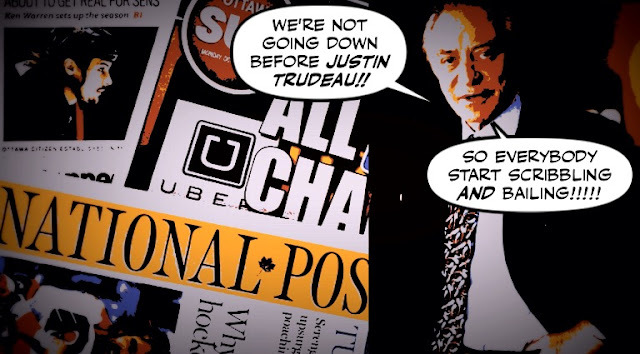 Somewhere in the heart of the dilapidated Postmedia empire, its big boss Paul Godfrey must be growing increasingly desperate. Desperate to bring down Justin Trudeau, before Postmedia goes down like the Titanic. For how else to explain that his scrawny scribblers are still grinding out story after story with the same basic headline? JUSTIN TRUDEAU IS BREAKING HIS PROMISES!!!! That must be about the twentieth one I've read in the last three weeks. Like all the others it's just wishful thinking and hot air, with a stench of desperation. And sadly for Godfrey and his Con gang, it's just not working. At first glance they may look like an odd couple. The hairy Rona Ambrose, and the equally hairy sloth from Australia. But it turns out they are both peddling the same message. You know, the one where that heap of glass tubing is supposed to be your brain after you smoke up. It hasn't yet snowed in the place where I live, and I'm having a hard time believing it's almost Christmas. And we do have so much to be thankful for, after having crushed Stephen Harper and his foul Con regime. But even as the light returns to Canada, there is also a threat growing out there in the shadows, and it couldn't be more monstrous. As we all know from the moment Justin Trudeau was sworn in, the Con media has been claiming that he is breaking one promise after another. And nobody has been screaming that louder, than the gang at Postmedia. So I wasn't surprised to see the old Harper hoofer Lisa Raitt, making the same absurd claim in the National Post. It was if the air was suddenly let out of the balloon. 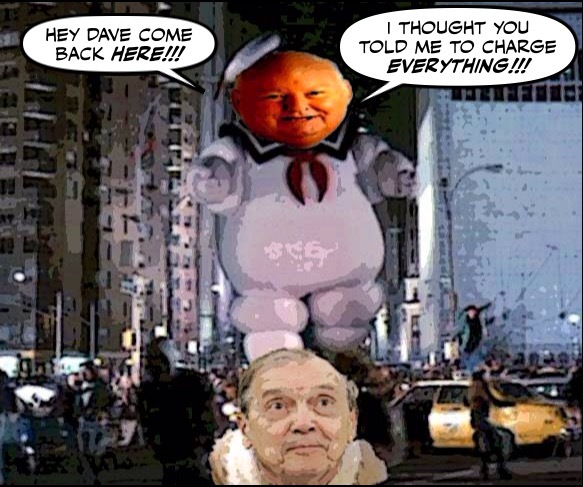 One moment the prosecutor was pounding Mike Duffy. The next moment he wasn't. The trial was suddenly adjourned. Ol' Duff was cut loose and left to float gently in the general direction of the ground. Without even being asked about the biggest charge against him, the bribery charge. 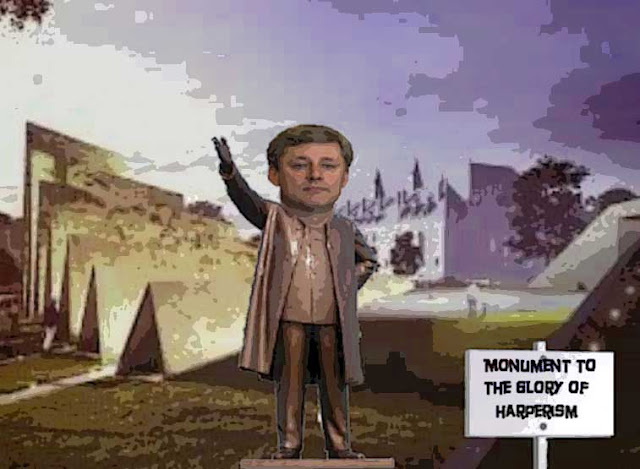 He was hoping to build this monstrous monument to himself on land reserved for a new Federal Court building, expected to be named after Pierre Trudeau. He was hoping it would be a kick in the face of the Supreme Court, and a final insult to the leader he once called a "tired out little old man," in one of the most disgusting obits ever written. But today the Liberal government announced the ghastly monument to the Victims of Communism will be moved. I'm going to have to try to restrain myself from saying nice things about Justin Trudeau, lest people start thinking I'm running one of his many fan clubs. 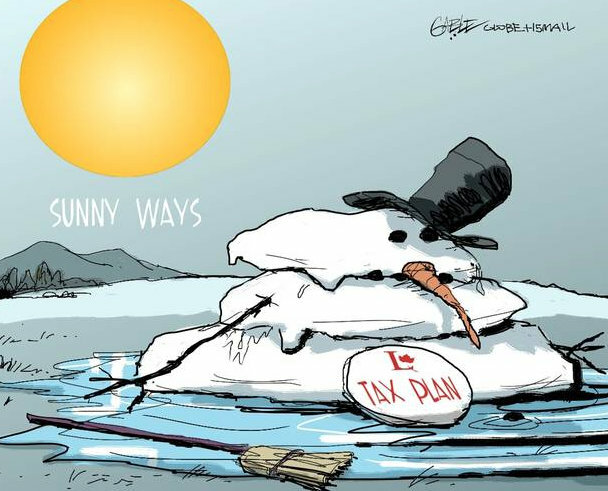 Which since I voted for the NDP might be called fraudulent, or get me killed by one of my bitter NDP friends. But it's really hard not to say nice things about Justin, because he just keeps doing and saying things that move me and inspire me. 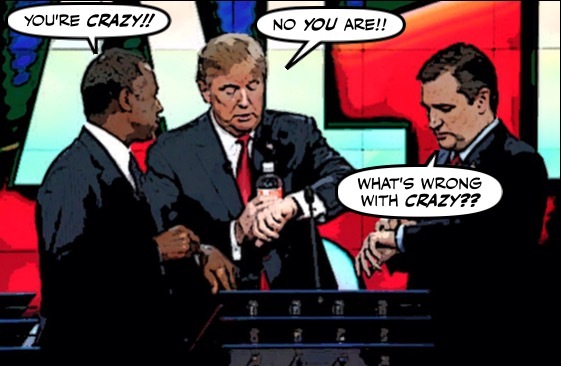 I decided to spend about an hour yesterday watching my first Republican debate. And a day later I'm still having nightmares about what might happen if any of those tea baggers ever becomes President. Because it couldn't have been more crazy or more disturbing. It was the day Stephen Harper had been dreading. The one that has forced him to keep such a low profile some are calling him the invisible man of Parliament. It was the dreaded day Mike Duffy mounted the stand, and pointed the finger at HIM. It was an amazing sight, and yet another sign that we are living in a very different Canada. 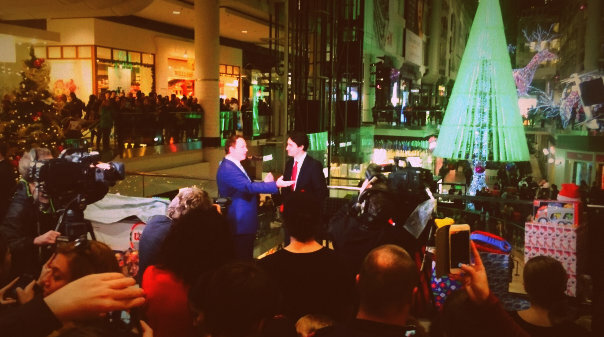 For there in the massive Eaton Centre mall, a place so full of frenzied shoppers these days I dare not enter it, was Justin Trudeau. And joining in a toy drive. If it wasn't Michelle Rempel, the Con clown whose burning ambition far exceeds her limited capabilities, I never would have believed it. 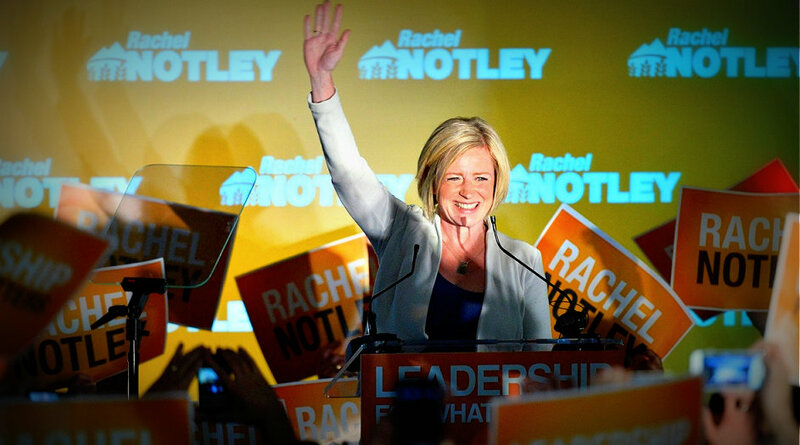 But at a time when Rachel Notley, the very decent premier of Alberta, has been receiving vicious death threats. At a time when the rednecks in that province have been having themselves a hatefest, claiming the NDP i.e. the commies, are trying to destroy or KILL family farms. 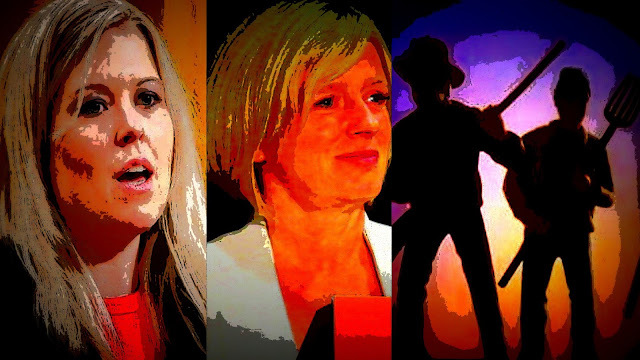 There is the wretched Rempel pouring more gasoline on the flames. It's not a perfect deal. It's the product of compromise, so it may not be enough to do what needs to be done. It remain to be see whether the countries who signed it, will have the political will to implement it. 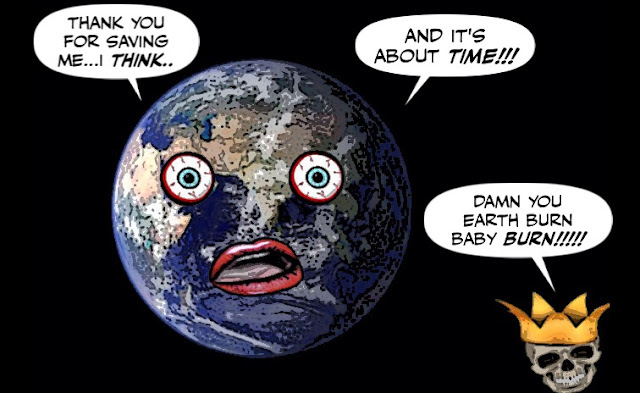 So that our beautiful little blue planet can be spared from the worst effects of catastrophic climate change. But because so many signed that deal, it is historic, and it is worth celebrating. Now Will the CBC Finally Fire Rex Murphy? It couldn't have been a more jarring contrast. While negotiators in Paris worked desperately to put the finishing touches on a historic climate change deal. And prepared to celebrate its successful conclusion. 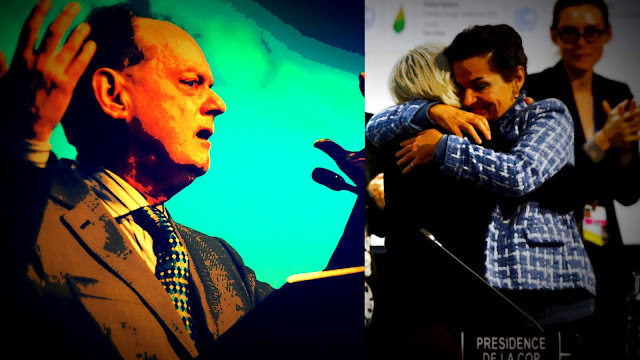 Back in Toronto, the Con clown and climate change denier Rex Murphy was clearly not pleased. Mounting his Petromedia Postmedia pulpit, to blow hot air out of every oily orifice. 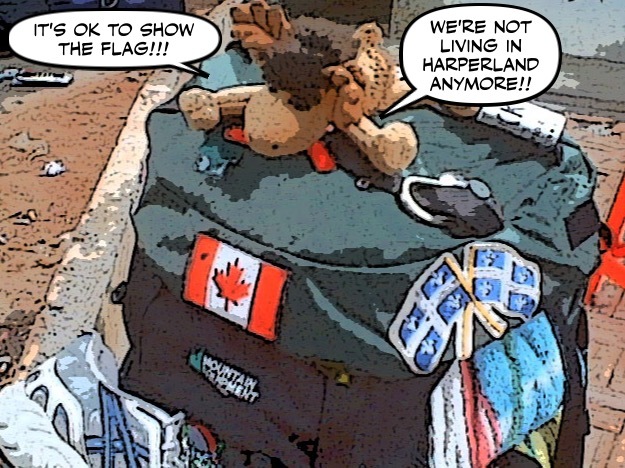 It's hard to believe, but it looks as if we can safely sew those little Canadian flags on the back of our backpacks again. After having to remove them during the Harper years. Because thanks to Justin Trudeau, and the way he welcomed the Syrian refugees in our name. When Rachel Notley was elected Premier of Alberta I thought it was a shining moment for that province. I thought she would be able to make Alberta more than a one-party petrostate, the land of the Con zombies, and the home of the Harperites. And would finally end its reputation as a haven for religious bigots and violent rednecks. But sadly that shining picture has darkened, and now some of those rednecks are threatening to assassinate her. As I've said before, the way the Cons and the Con media have gone after Justin Trudeau from the moment he was sworn in, couldn't be more unfair or more disgusting. They have gone after his children, they have gone after his wife. 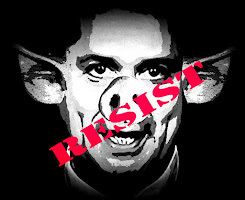 Labels: Con clowns, Con media, Justin Trudeau, The Death of Con Canada. 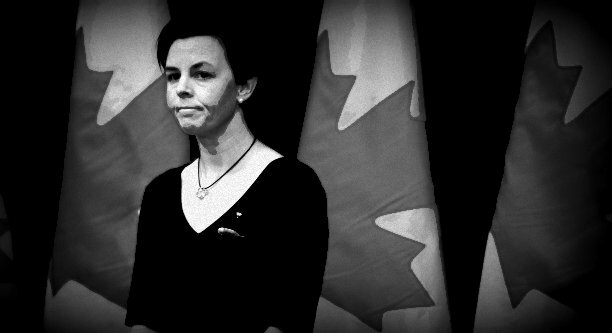 I realize Kellie Leitch is frustrated. A few weeks ago she had to be told to cool her jets by other Cons. Because she was apparently getting ready to announce her candidacy for permanent leader of the Harperless party, at least a year before the leadership convention. 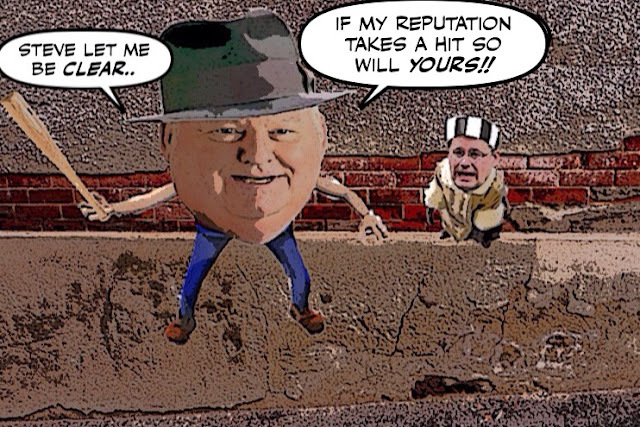 Well you have to hand it to Mike Duffy. 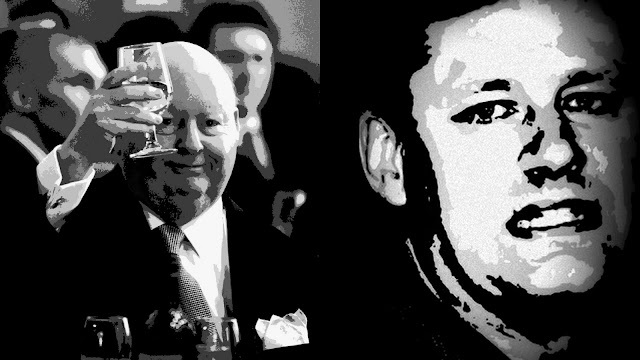 His trial may not be as popular as it once was, but he's still doing a number on Stephen Harper's legacy. First he claimed Harper couldn't be trusted. Then he claimed that the powerful Con senator David Tkachuk encouraged him to claim every expense he could. 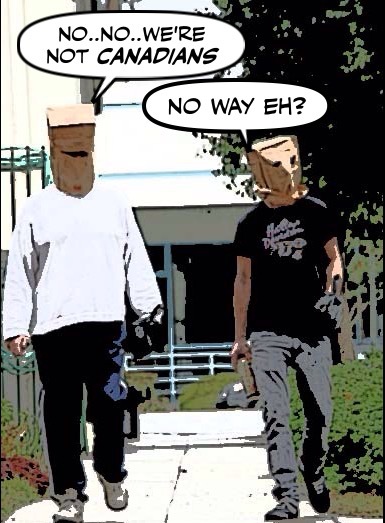 Now he's claiming that the Cons used robocalls in BC to win an election. It was only Rona Ambrose's third Question Period as Leader of the Opposition. And there she was yesterday, trying to look like she's really in control of her shattered party, that she knows what she's doing. And that she's the steady hand on the wheel of the Con shipwreck. Only to suddenly seem to lose it, and let out a primal scream. Labels: Electoral Reform, Justin Trudeau, Pierre Poilievre, Rona Ambrose, The Death of Con Canada. 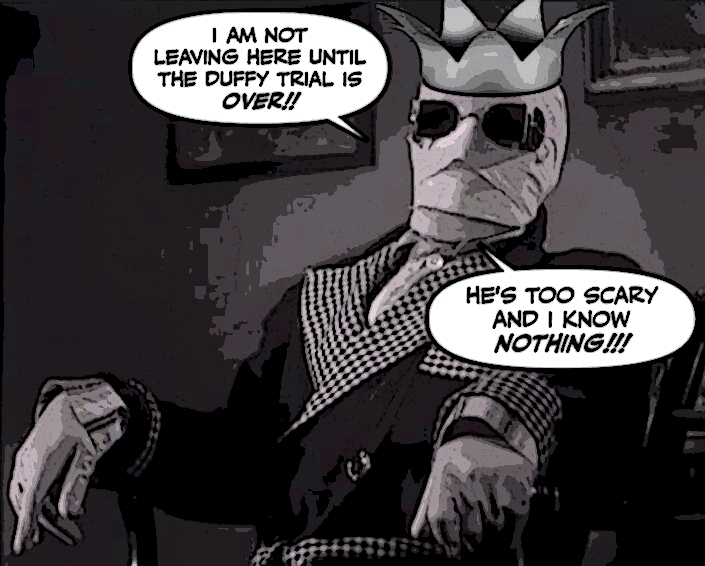 Oh dear, I see that the Mike Duffy trial just keeps on getting messier for the Cons. Yesterday Ol' Duff claimed that Stephen Harper couldn't be trusted. Now he's going after the Con senator David Tkachuk. Telling the court that Tkachuk told him to claim every expense he could. In my last post I wrote about Donald Trump and the politics of hate. And I pointed out that Stephen Harper was our mini Trump. Who helped set our country on fire. Before he went down in flames. 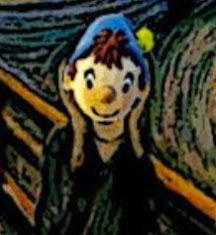 But now the ultimate nightmare. 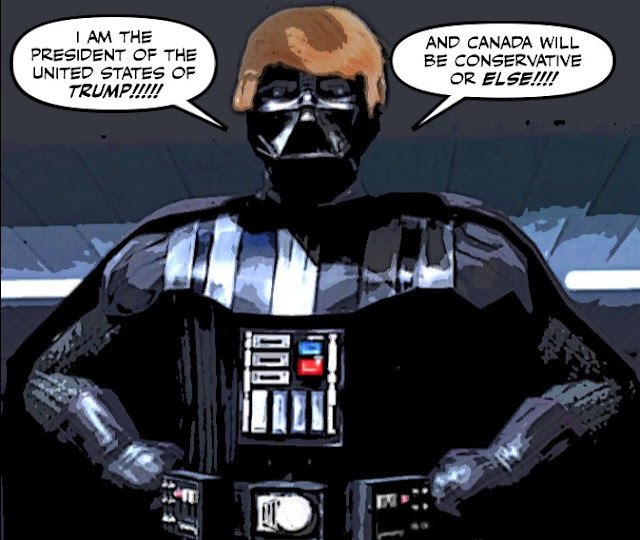 What if that smelly bigot with the deathly comb over is Darth Trump? And he wins the next election. I'm sure you know how I feel about Donald Trump. I've called him a fascist buffoon before, and compared his hair to one of the most poisonous caterpillars in America. But now that so many people all over the world feel the same way, including our new government. 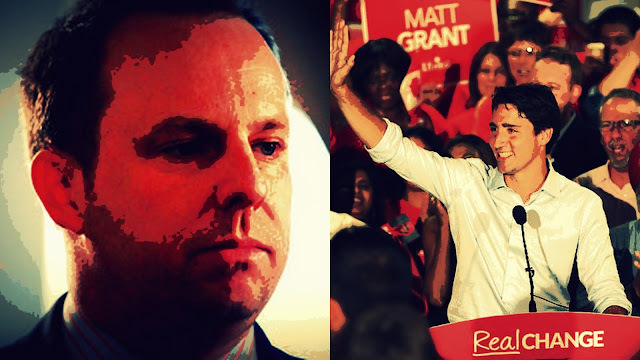 In an unusual move, the Canadian government, which usually refrains from commenting on foreign election campaigns, joined the chorus of those criticising Trump. 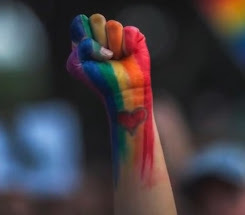 “It’s something that we can’t accept in Canada ... We have never been as far removed from what we’ve just heard in the United States,” foreign affairs minister Stephane Dion said. Well the big day finally arrived. Mike Duffy finally got the chance to take the stand and tell his side of the story. And although it would have been better before the election than after it. And we didn't really need to know that Duffy now needs regular injections in his eyeballs. He didn't disappoint me. For not only did he claim that making him a Senator from P.E.I. was all Harper's idea. He promised he'd lead us to prosperity, in the golden tar ponds of Albertonia. He spent a billion dollars of our money trying to brainwash us into believing that he was a Great Economist Leader. But now the chickens, or the bats from hell, have come home to roost. And it isn't The Rapture. 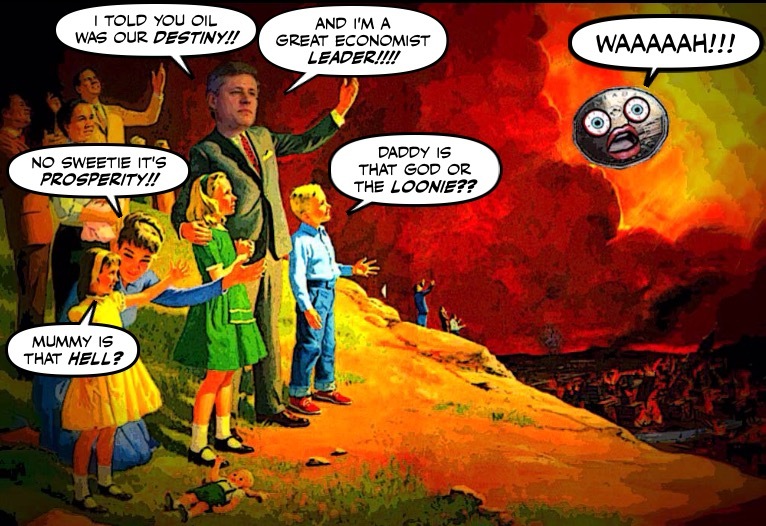 It's the Oily Inferno or the loonie apocalypse. I don't know whether Stephen Harper will turn up for Question Period today, because he didn't bother or dare to attend the Throne Speech. And people are starting to call him the invisible man. The man who can't be seen, or dare not show his face. Because he's either too crushed, or too humiliated, or can't stand the sight of The Man Who Was Not Ready sitting in his seat. But still clings to his lowly MP's seat, and his parliamentary immunity, in case he's suddenly dragged into the Duffy trial. For who knows what Ol' Duff might say when he takes the stand in his own defence? 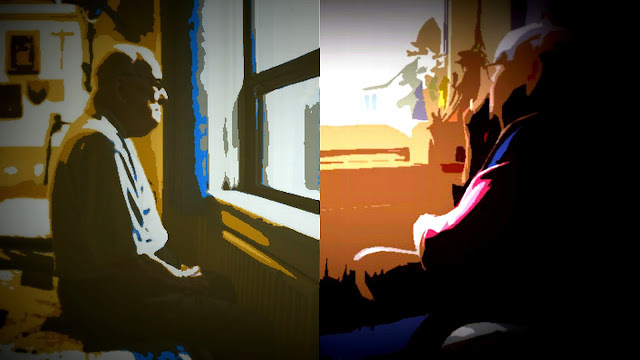 When I was a boy my grandmother read me a story about an old woman whose body was discovered in a rooming house, days or weeks after she died. And although my canny granny was probably just trying to guilt me out for not visiting HER enough i.e. more than four or five times a week. That story changed forever how I viewed seniors and loneliness. At a time when the United States is going through yet another spasm of gun violence. 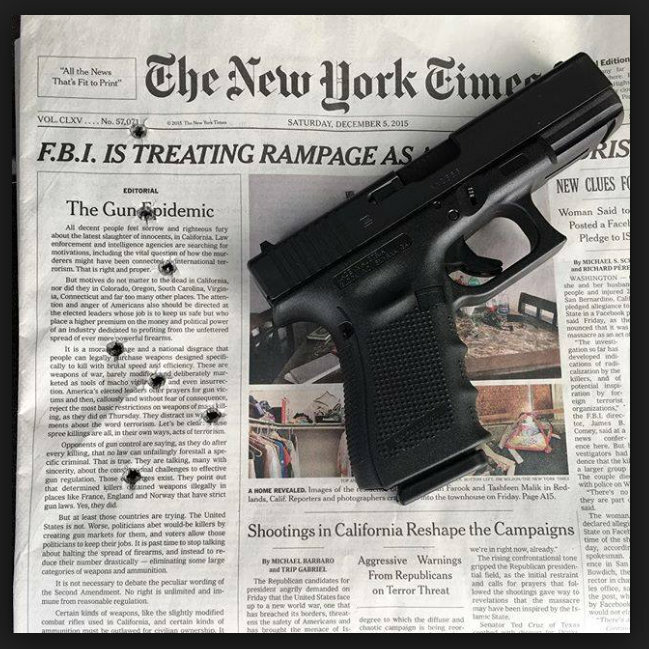 And I see how some wing nut in that country reacted to this editorial in the New York Times. I'm glad that I live in Canada, and grateful that today is National Day of Remembrance and Action on Violence Against Women. 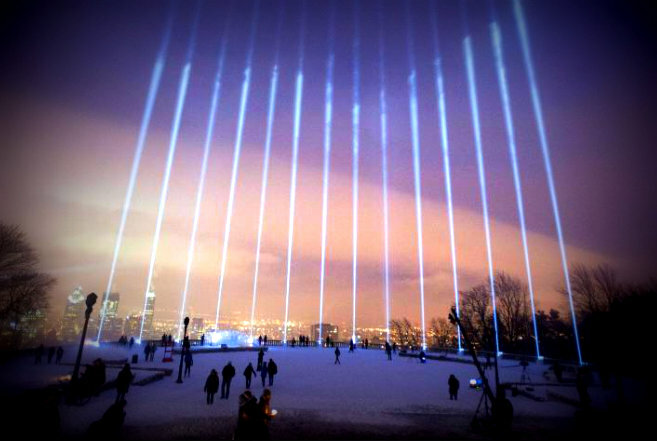 And that Justin Trudeau, our new Prime Minister attended a ceremony on Mount Royal, where 14 beams on light were projected into the sky. To remember these Canadian victims of gun violence. 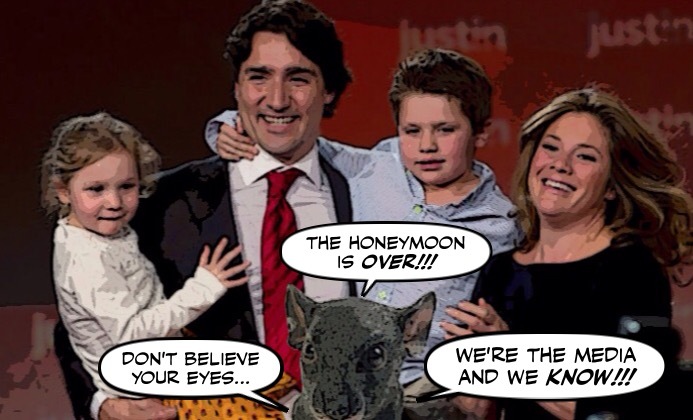 From the moment he was sworn in the Con media has gone after Justin Trudeau like a pack of rabid rats. They have attacked his wife, they have attacked his children. 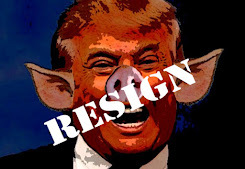 They keep claiming that his honeymoon is over. But sadly for them they don't seem to know their own country, and are almost certainly going to be bitterly disappointed. 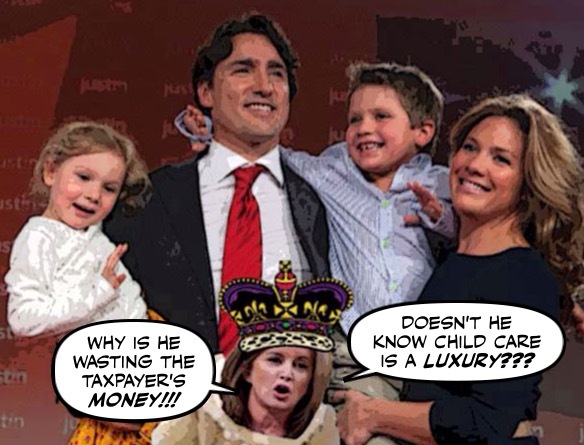 As you may know Rona Ambrose has always been a ghastly hypocrite. 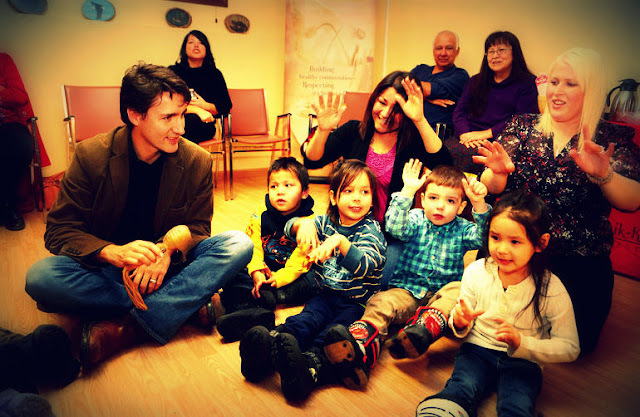 Who would go after child care for the Trudeau children, while claiming to be a feminist. Or even worse, pretend to be a doctor. While sentencing thousands of heroin addicts to death by making it almost impossible to set up needle sharing clinics. It was the most magical throne speech I've ever seen. The new leader stepping forward. 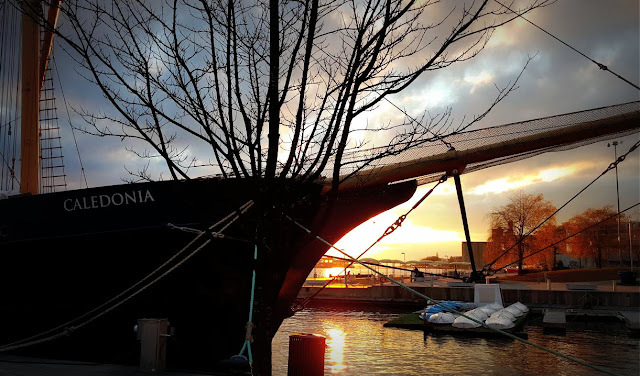 the old one rotting in the shadows. 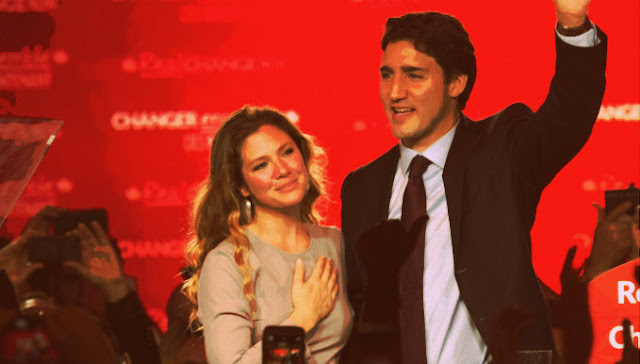 The promise to take our Canada back. Justin Trudeau is signalling that his government will make a clean break from the policies and practises of its Conservative predecessors with a relatively short Speech from the Throne that promises a cleaner environment, an enhanced social safety net, and a new era of openness and transparency. And to make it even more wonderful, the thought of the Cons screaming at the sound of the promise that will destroy them. 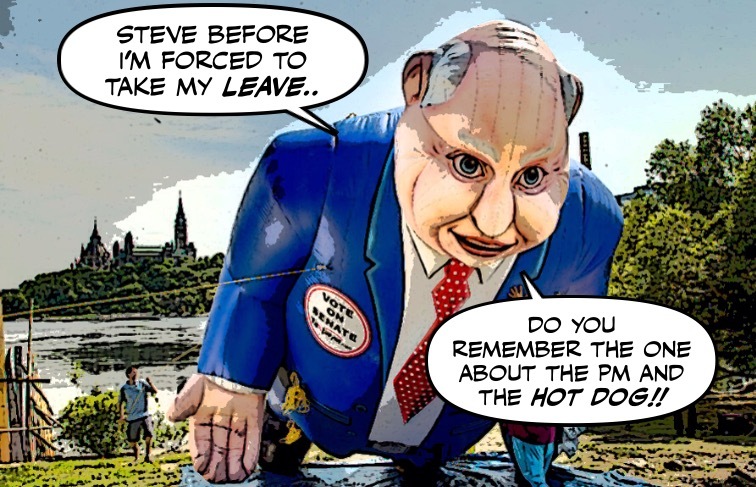 When Stephen Harper fanned the flames of bigotry during the election campaign for crass political purposes, I predicted that the fires he was starting would be very difficult to put out. And sure enough, now the newspapers are heaving and churning with racist comments. Anti Muslim bigotry is being used to create a backlash against the refugees who will soon be arriving here. A photo surfaced on twitter from Tuscany station where the escalator had been sprayed in silver paint with the misspelled words: "F-K Syrea, Kill Musilums". 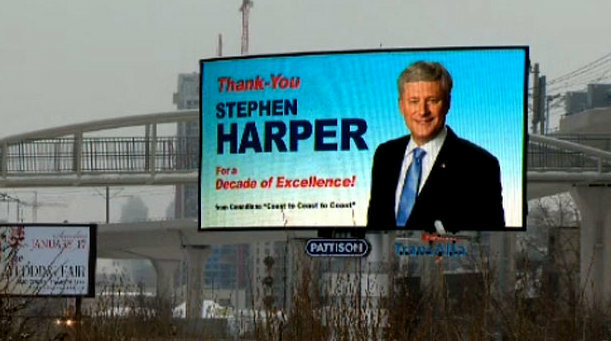 And this too is Harper's foul legacy.